Moving to San Diego can be a thrilling experience. It can also be overwhelming, especially if you’re moving across the county. Drive in, fly in, boat, or take a train, any way you get here we’re glad you came! Let’s check out the sunny side of Mission Valley, a suburb of San Diego, California and see what this bit of paradise has to offer! Mission Valley has been called the center of San Diego. The tagline for tourism is “In the middle of it all.” and it’s true. Anything you want to eat, buy, or do can be found in Mission Valley! The valley is divided into two distinct areas, Mission Valley East and Mission Valley West. The San Diego River runs through both and empties into the Pacific Ocean. If you’re moving to this area, chances are you already know it’s one of the most desirable locations to live in the country, and with 146 completely sunny days and 117 partly sunny days you’ll develop a great tan! Taking a vacation to a city you’re thinking about moving to is a great way to find out if it’s for you, and this move is no exception. Living just minutes from the San Diego International Airport, visitors can meet up with you quickly in Old Town, the San Diego Zoo or the Gaslamp District in a jiffy. Some of the must-see tastes, sites, and sounds of this area include a visit to the Old Town Tequila Factory and Restaurant where you can experience a proprietary tequila recipe while enjoying a scenic hillside view. Whaley Haunted House will give you a historical scare and a trip to Bazaar del Mundo should be on your schedule if you’re looking for a unique shopping trip that will have you scouring for souvenirs! Fashion Valley Mall will tickle the taste buds of shoppers and outdoor enthusiasts alike. Adventure seekers will want their first stop to be Mission Trails Regional Park where taking a vertical trip up Cowles Mountain will reward you with 360-degree views of the entire valley! If a visor and 27 holes are more what you have in mind, the Riverwalk Golf Club spans 200 acres and is widely regarded as one of the most beautiful golf courses in the country. History buffs will want to make a trip to Belmont Park, an iconic beach amusement park built in 1925. Be sure to snap a selfie on one of the world’s oldest wooden roller coasters (on the west coast), the Giant Dipper. Authentic Mexican food will be waiting for you when you’re finished exploring, so a trip to Cafe Coyote or the Cosmopolitan Restaurant & Hotel is just what the chef ordered! India Street in Mission Hills will give you an international taste of all the flavors Southern California has to offer. Lack of food and drink will never be a problem in Mission Valley. The margaritas are on point (thanks to the local tequila), and the craft brew scene is super popular right now. Founded in 2017, Protector Brewery is a regional producer of organic stouts and is just one of many great places to get a drink. Mission Valley has an impressive list of hand-crafted options! The majority of people who call Mission Valley home are between the ages of 25 and 34-years-old. This creates a young vibe and you’ll find residents being creative when it comes to career choices. Thanks to technology, “The Morning Rush” and “5 O’Clock Traffic” could someday be a thing of the past. Have you ever heard your parents say, “get your head out of the clouds!”? Well in San Diego working within “the cloud” may soon be a source of pride for them! VisionTree is one of the latest web-based tech companies focused on healthcare to make Mission Valley it’s home. This cloud-based, patient-centered company touts an independent work environment along with online training. Who said you couldn’t afford to live here?! Companies like this one help young professionals save on gas and lunch by giving them the opportunity to work in a flexible environment (i.e., home or coffee shop). The income per capita is $45,086 per year in Mission Valley, but the sky’s the limit! 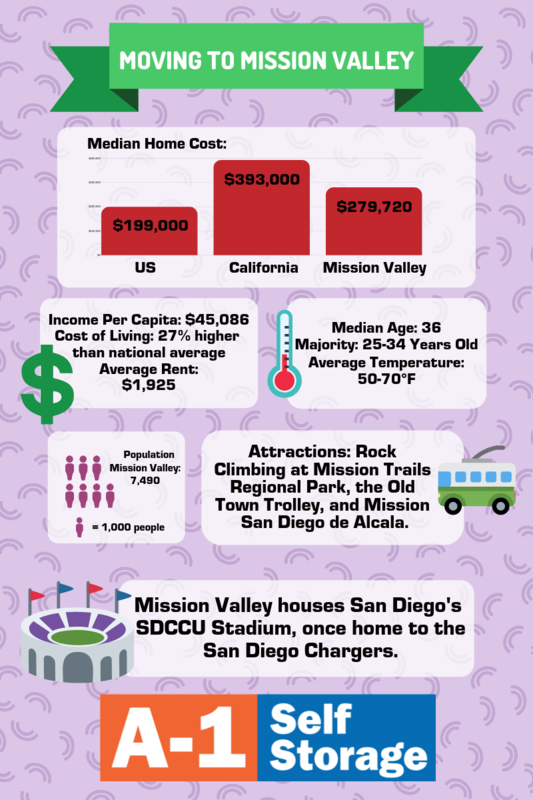 Mission Valley’s cost of living is 27% higher than the national average, but that’s the cost of living in paradise. Median home costs here are $279,720 (less expensive than the California average). If a purchase isn’t in the cards right now, try renting an apartment or condominium! The average monthly price for a rental is here $1925. How about it? Isn’t it time to jump in with both feet and explore what life in sunny California is all about? Do you have too much stuff and dread a move across the country or even across the street? Don’t sweat it! We at A-1 Self Storage Mission Valley have a place for all your possessions! We can help you pick the best storage unit for your budget and needs. We have everything you need for packing and moving your items safely including boxes, tape, mattress bags, and more. Our clean, secure premises and friendly staff are here to help any storage situation. Get your moving plan in place and start renting with A-1 Self Storage today!